Straightforward, boundless and uncomplicated. 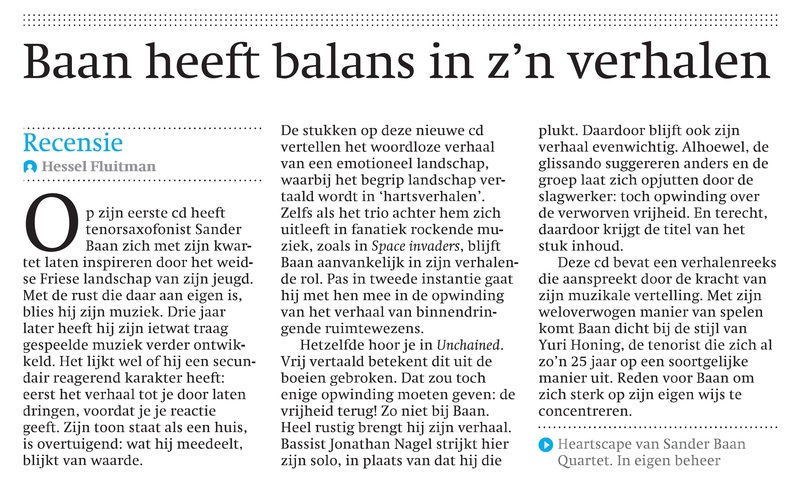 The Sander Baan Quartet plays without pretense: music from the heart, not from the brain. Each tune tells a personal story with it’s own distinctive character, evolving along a path full of unpredictable twists and turns. As in life we are longing for beauty and peace but sometimes meet adversity and chaos, so the band explores a broad range of emotions, combining lyrical passages with explosions of raw power. 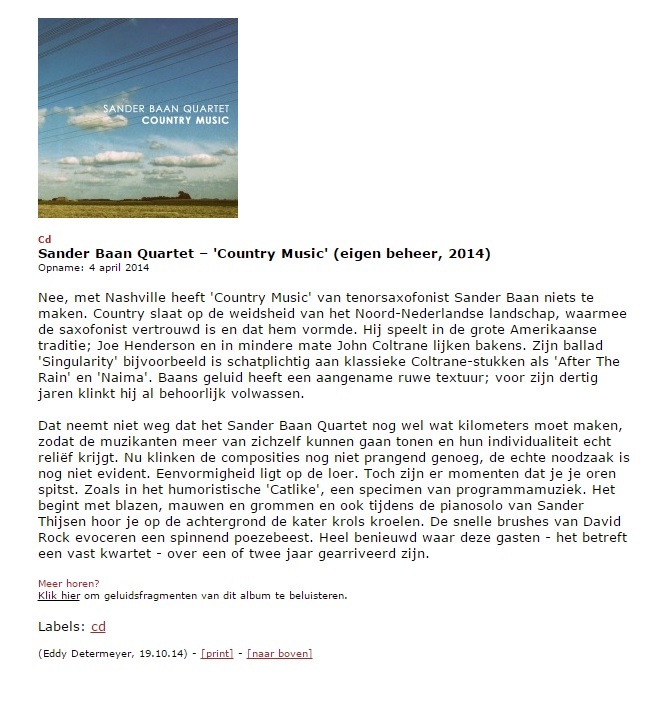 The two years following the release of their debut album Country Music, the Sander Baan Quartet toured the Netherlands as well as Germany, Belgium and Romania. The 2014 release opened doors to the famous stages of Berlin such as Bb-Flat and Schlot and also set up a beautiful collaboration with saxophonist Tineke Postma at the Noorderzon festival. The timing was just right for the follow-up. 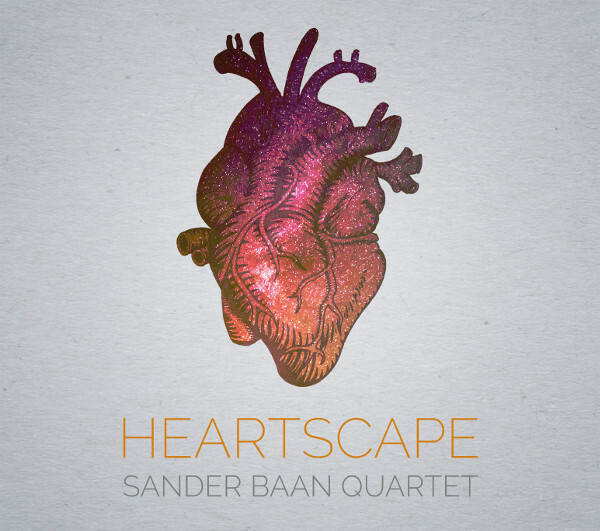 Heartscape marks a new step for the Sander Baan Quartet, bringing the group closer to the heart of the matter. 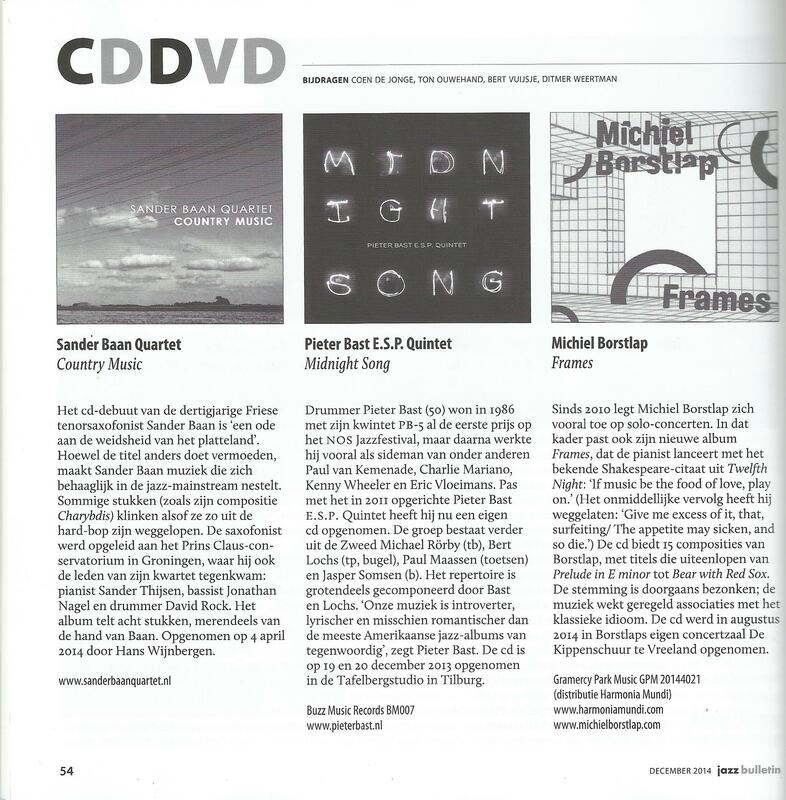 All compositions by Sander Baan except "I didn't expect to like you", "Casual Superhero" and "Northern Sun", by Jonathan Nagel. Recorded, mixed and mastered at Fattoria Musica by Steffen Lütke, between November 2016 and April 2017. Distribution by Timezone Records. Country Music gently dissolves the boundaries between contemporary jazz, rock and pop. The compositions on Country Music take different paths, winking at pop music more than once and exploring different ways of treating it. The whole album is rife with tenderness and a subtle irony. Even a hard-bop tune like Charybdis emanates some sweetness, which escalates in the most heartbreaking tune, Singularity. Each member of the group is really concerned with his sound. 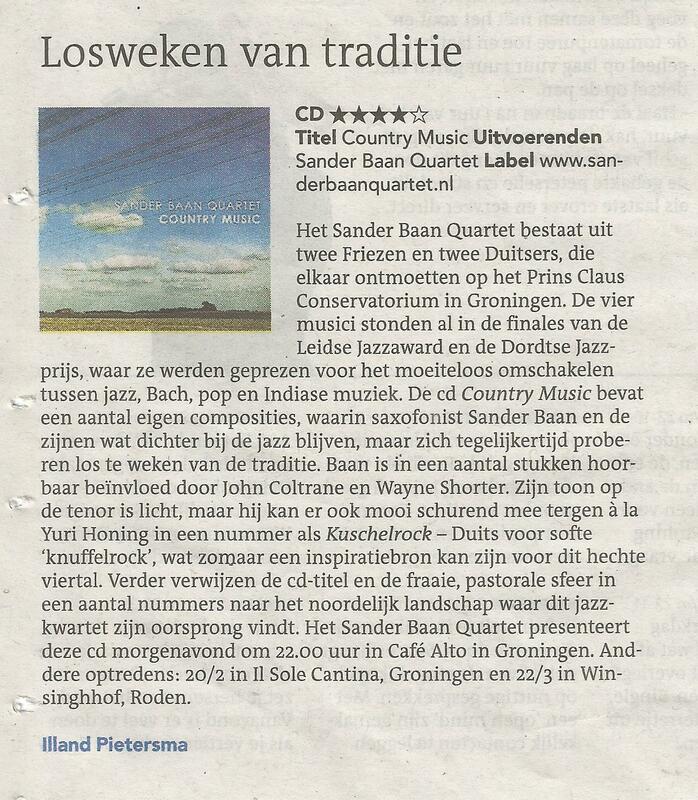 Sander Baan has developed a dark sound full of overtones which slightly reminds of Jan Garbarek. The delicacy and elegance of Sander Thijsen’s touch shines on Singularity. David Rock’s evocative intro leaves its mark on As the Storm Passes By. Jonathan Nagel manipulates his sound with freedom creating fascinating textures on several tunes. Sound is what music is made of and the band gives it the right priority, enhancing the immediacy of the listening experience: the notes of Country Music go straight to your heart. 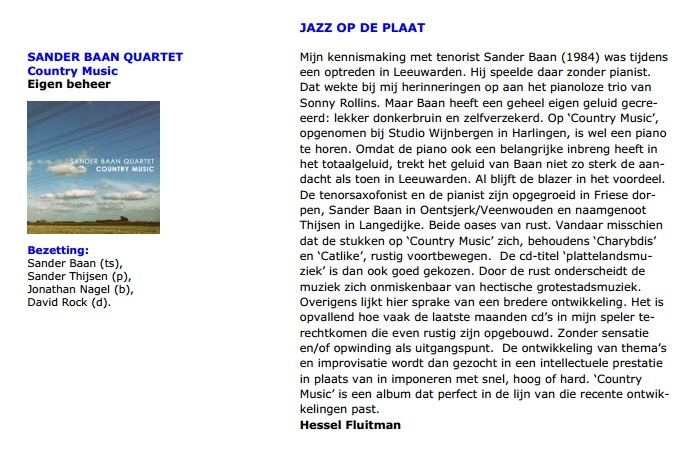 All compositions by Sander Baan except "Over (and over again)" by Sander Thijsen and "Catlike" by Jonathan Nagel. 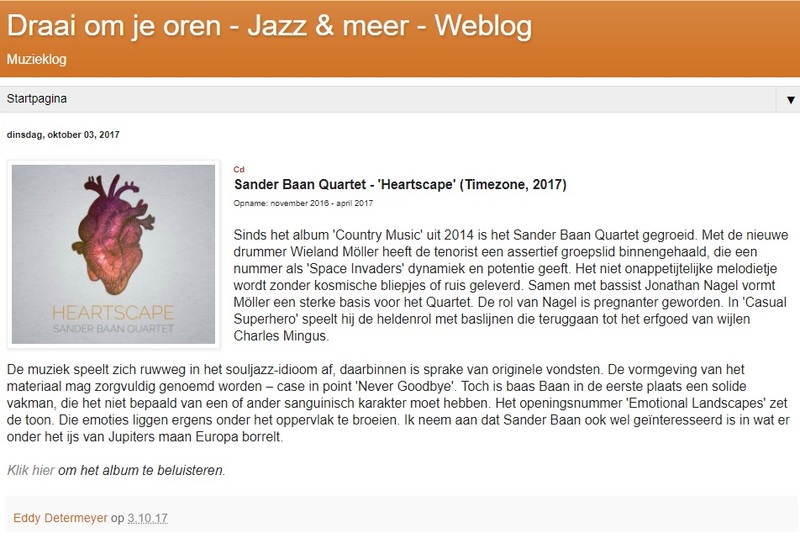 Recorded, mixed and mastered at Studio Wijnbergen by Hans Wijnbergen, between April and July 2014.